When a passenger plane malfunctions and begins to nose dive out of control, an experienced pilot pulls a risky move that rolls the plane upside down in order to land it safely with only a handful of deaths. At first he is pegged as a hero, until it was discovered that he is an alcoholic and had been drinking on that day. An investigation is then led into the cause of the crash while the pilot, Whip Whitaker, attempts to get a hold of his drinking problem. 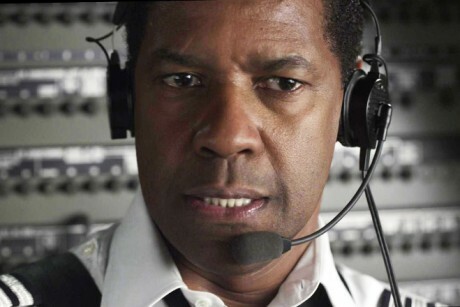 There are two amazing facets to this film: the opening half-hour involving the plane crash itself and the character of Whip as performed by Denzel Washington. Director Robert Zemeckis hasn't made a live-action since 2000's Cast Away, a favourite of mine. He's been unfortunately dabbling in the motion-capture business for a decade until Avatar, Tintin and Gollum came out and showed him up. Like Cast Away, he once again pulls off one of the most intense and well crafted and plane crashes committed to film. This one is a lengthy plummet as Whip struggles to keep his plane in the air as long as he can. Although he is worried like everyone else aboard, like a true captain, Whip demonstrates authority and competence in landing this plane like he has planned for it his whole life. Both Denzel's conviction and Zemeckis' craftsmanship combine to make one of the best scenes of the year. As this happens in the first half-hour of the film, we now have the intriguing character of Whip Whitaker played fantastically by Washington to help us through the remainder. A dry and boring film could easily have followed the crash, but the character is such an interesting conundrum whom I haven't seen before, I found it engaging. Whip is an odd person. He is not a sad sack alcoholic, he is not our indelible antihero, nor is he the easy to root for good guy. He is a mix of all three. Whip knows that he drinks and can be convinced that he has a problem, but for the most part he can be in control of himself. He tries to be honest to himself, but this requires him to lie to others. So, by having a complicated character who is sometimes a hero and sometimes a wreck, this results in an uneven film that flip-flops tones and has trouble placing its sympathy. One moment we are dreading his return to the drink, the next we are relishing in his hangover and he is enjoying it. With a stellar opening act and a refreshing performance by Washington as an intriguing protagonist, Flight certainly has its merits. It is just unfortunate that an opening scene and great acting is all that is going on here. If you’re looking for something more from the creator of such classics as Back to the Future, Who Framed Roger Rabbit, Forrest Gump and Cast Away, you may be disappointed. But simply put, this is a perfectly well-crafted character driven film. I am at least thankful that Zemeckis is back to making live action films.